Author: Barbara M. Dossey, PhD, RN, AHN-BC, FAAN, HWNC-BC, et al. Holistic Nursing: A Handbook for Practice, Seventh Edition is the definitive resource for holistic nursing for both students and professionals. 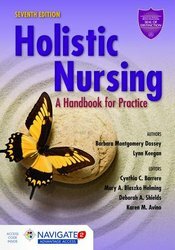 It includes seven new chapters on creative expressions in healing, herbs and dietary supplements, holistic leadership, holistic nursing education, self-care and self-development, and advanced holistic nursing practice. Each chapter begins with Nurse Healer Objectives to guide learning within the theoretical, clinical, and personal domains and concludes with Nurse Healer Reflections to encourage readers to reflect on what they have learned. Holistic16 consists of three sections, each worth 22 contact hours, or a total of 66 contact hours when you've finished all three.